Thanksgiving is a wonderful time of year, kids will love making these fun crafts! Thanksgiving reminds us to focus on what we are grateful for. It is so fun to ask little ones this what they are grateful for. Be sure to either film it or write down their answers, they will be cherished for years to come. 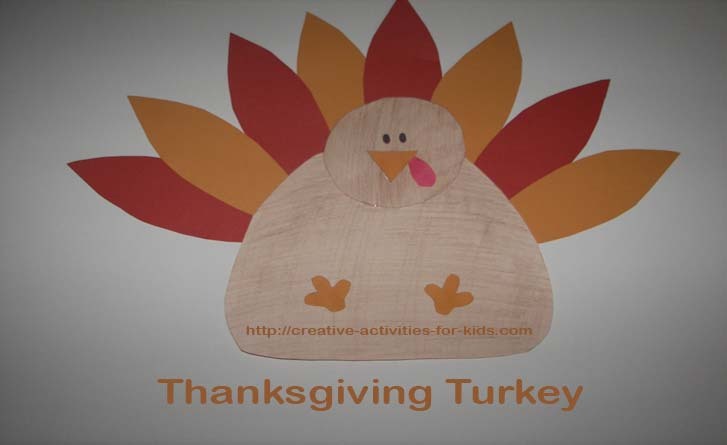 This turkey cut out is a cute,fun, and easy Thanksgiving craft. Just click on the links below to print out the templates. I routinely did this with my preschool group each year, I would laminate the finished projects so the kids could use the turkeys as place mats. I use heavy paper to make these, because they hold up better. You can trace the templates onto card stock paper so you can save and reuse the stencils for years to come. You can trace these on colored paper or white paper so your kids can color them. Then have your children glue the parts together. If you would like to make these into place mats you will need a roll of contact paper, or you could get them professionally done. Did you like the Thanksgiving Crafts page? Check out more holiday fun here!